Our Blog about the latest, most popular, and top rated online games 100% for free. Wide selection of articles about games on Ponged by genre: action, adventure, strategy, puzzles, sports, RPG, and shooting. What is it? – In Dragon Flame 2, you take on the role of a giant red beast that must defend its nest from waves of would-be dragon slayers. Who made it? – The game was produced by Morphee Studios. How does it play? – The red-scaled protagonist of Dragon Flame 2 reminds me a lot of Smaug, the giant, treasure-hoarding red dragon from Tolkien’s, The Hobbit. Despite its massive size, your dragon controls rather gracefully, swooping and gliding after your mouse pointer. Enemy units (including archers, mages, and knights) become more plentiful and powerful with each wave, and will relentlessly attempt to bring you down. 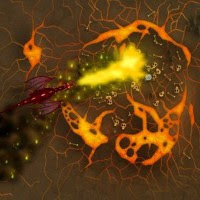 Your basic spark attack is used by targeting with the mouse and left-clicking, and is good for dispatching weaker enemies. Killing foes adds to your “rage” meter, and when the meter is full enough, you can use other abilities like large fireballs, a spinning tail-strike, or the “flamethrower” breath-weapon which acts like its name implies. After each wave, you can restore your dragon’s health or upgrade things like speed or power. Having to choose between replenishing health and upgrading abilities means that you’ll want to perform as well as possible on each level so that you can upgrade instead of heal. Presentation – The backgrounds and your dragon are wonderfully detailed, and character animations are solid across the board. The sounds are also great, from the various fire effects to the yelps and screams of roasting enemies. Enemy units are much smaller than your dragon (understandably), and though enemies on horseback visually distinguished, many of the on-foot units look a bit generic and similar. Positives – The game an arena-shooter, but puts players in control of a very powerful character and asks them to overcome masses of weaker enemies. As the waves progressed and the difficulty ramped up, I couldn’t help but understand my dragon’s desire to rid its home of the mosquito-like humans. You also get a cool ranking based on your performance at the end of each game, which is a nice bonus. Negatives – Despite the upgrades, unit varieties, and great production values, the gradual progression is perhaps a bit too subtle between any two individual waves. This can lead to a sense of repetition, or a feeling like you’re not making much progress. It can also be tricky to simultaneously keep tabs on the action and the ever-fluctuating rage meter, and since many of your powers have a rage prerequisite, you might occasionally frustrate yourself trying to perform a special move that requires more rage than your current level. Why you should play it – Dragon Flame 2 is a polished arena-shooter with progressive difficulty that lets you fly around and torch annoying humans with powerful attacks. Still not sold? The control scheme is also unique and interesting enough that long-time shooter fans should really give it a go.